Fever of unknown origin remains a frequent problem in the pediatric population. Hypothalamic thermodysregulation is a probable cause of pyrexia of unknown origin in a minority of patients. Here, we report a case of reverse Shapiro's syndrome, a combination of periodic hyperthermia and corpus callosum agenesis. A 3-month-old female infant weighing 5 kg delivered by cesareαν section and born out of non-consanguineous marriage was admitted with a history of high fever for one week. According to the parents fever was high grade (104 -105° F) without any diurnal variation and was not affected by environmental temperature. Examination revealed a febrile (Axillary 105° F), irritable infant. Her blood pressure was normal and there was no dysmorphism or physical abnormality. With regard to the milestone of development, she had achieved a social smile, followed moving objects, there was head lag on pull to sit position, her muscle tone was normal and there was no focal neurological deficit. Her head circumference was 40 cm and anterior fontanelle was flat and normal in size. During her stay in the hospital she had one episode of convulsion at the height of fever. Physical examination failed to reveal any focus of fever. Investigations revealed a normal complete blood count, peripheral blood smear, blood biochemistry, liver function tests and renal function tests. Sepsis work-up including blood culture, C-reactive protein and urine culture, chest X-ray, ultrasonogram of abdomen and echocardiogram did not reveal any abnormality. Cerebrospinal fluid analysis was normal. Sonogram of brain reported mild ventriculomegaly. Patient was put on broad spectrum antibiotics. After 2 weeks, fever subsided and the patient was discharged. A week later, she was readmitted with high fever. This time extensive investigations, which included viral serological tests, immunological work-up [anti-nuclear factor for lupus, serum immunoglobulin], thyroid profile and cortisol level, were carried out all of which were within normal limits. Bone marrow examination was suggested but the parents denied. 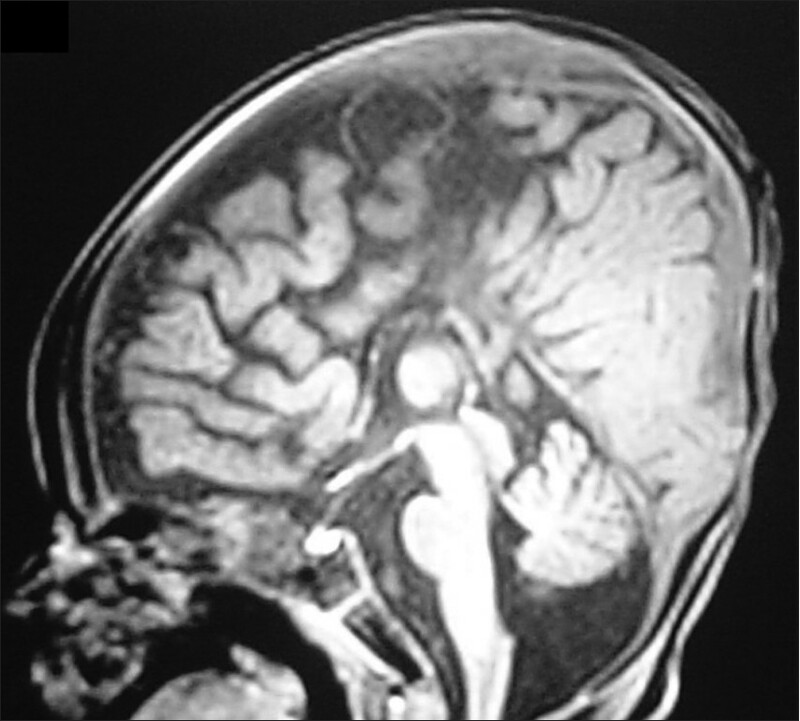 MRI brain revealed corpus callosum agenesis [Figure 1] and [Figure 2]. In view of corpus callosum agenesis with recurrent hyperthermia and absence of any incriminating autoimmune, neoplastic or infective factors identified, a diagnosis of reverse Shapiro's syndrome was considered. The patient was put on a low dose of levodopa, however, the response was inadequate and the therapy was stopped. She's kept on regular follow-up. She's now 14-months-old with mild developmental delay. She continues to have periodic bouts of fever, which is treated with tepid sponging and other physical measures. Although infections predominate as the principal cause of fever, hypothalamic dysregulation should be considered as a rare cause of apparent pyrexia of unknown origin. To the best of our knowledge this is probably the first case report of this syndrome from India. We stress the importance of recognition of this syndrome as it is a rare but a possible cause of pyrexia of unknown origin. 1. Shapiro WR, Williams GH, Plum F. Spontaneous recurrent hypothermia accompanying agenesis of corpus callosum. Brain 1969;92:423-36. 2. LeWitt PA, Newman RP, Greenberg HS, Rocher LL, Calne JD, Ehrenkranz JR. Episodic hyperhidrosis hypothermia and agenesis of corpus callosum. Neurology 1983;33:1122-9. 3. Hirayama K, Hoshino Y, Kumashiro H, Yamamoto T. Reverse Shapiro's syndrome -a case of agenesis of corpus callosum associated with periodic hyperthermia. Arch Neurol 1994;51:494-6. 4. Lin KL, Wang HS. Reverse Shapiro's syndrome - an unusual cause of fever of unknown origin. Brain Dev 2005;27:455-7. 5. Parrish ML, Roessmann U, Levinsohn MW. Agenesis of corpus callosum: A study of the frequency of associated malformations. Ann Neurol 1979;6:349-54.